One of the most portable and versatile ramps available. Great for use as a portable wheelchair ramp or scooter ramp for users who want an option to expensive chair lifts, permanent ramps. Lightweight yet Strong — Aircraft Aluminum supports up to 1,000 lbs. No matter how the system is configured; short portable ramp to extensive modular ramp, your Roll-A-Ramp® ALWAYS remains portable. 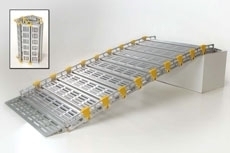 Unique Design — Patented link construction means you will never have the wrong size portable access ramp; simply add additional links to change length with simple tools provided with your ramp. 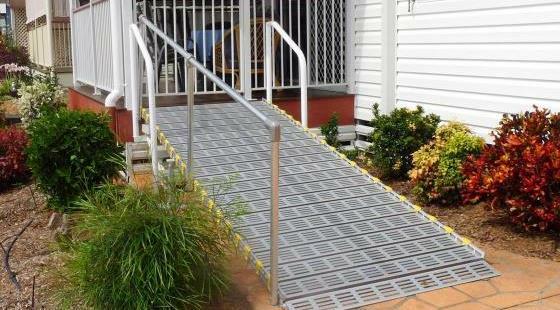 The Roll-A-Ramp® Modular Ramp System can be configured to any length needed. Unlike other ramps where once you reach 10-foot in length, you are limited to a modular system designed to stay in place, the Roll-A-Ramp® system gives you the versatility of still having a portable system — at any length! Handrails can also be added to one or both sides. Whether you are staying put or on the go, Roll-A-Ramp is less costly than lifts and elevators, permanent wood or concrete ramps – and much more versatile. Our custom platforms allow the ramp to turn at a 90-degree angle. Can be confrigured as multiple ramps in one - ask how! 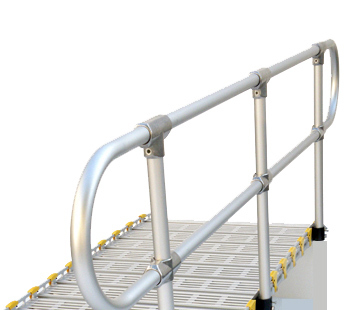 Aluminum handrails are available as an addition to your Roll-A-Ramp®. Ramp handrails work for all sizes of ramps and will add additional stability & security for those who need it. Handrails are also customized to the length you need and can be added to one or both sides of the ramp. Handrails will not rust or corrode in rain and snow. Portability & Ease of Install/Removal. All Roll-A-Ramp systems are designed around these principles to maintain our high standard of commitment to quality and service to our customers. Ramp handrails are very easily installed onto your Roll-A-Ramp®, and if needed, removed even easier with a couple simple steps – making your ramp and handrails very easily portable. Portable & Versatile: For example, ramp handrails can be put onto your ramp & if you choose to take them off, want to relocate or store the ramp, or need to remove them for getting access to the ramp from the side – no problem. In literally a couple of minutes it’s done. It is the quickest system on the market. Ramp handrails are inserted into the brackets – tightened with 1 bolt to secure into bracket. Removing the ramp handrail is even easier – 1 bolt loosening and rails lift out of brackets.